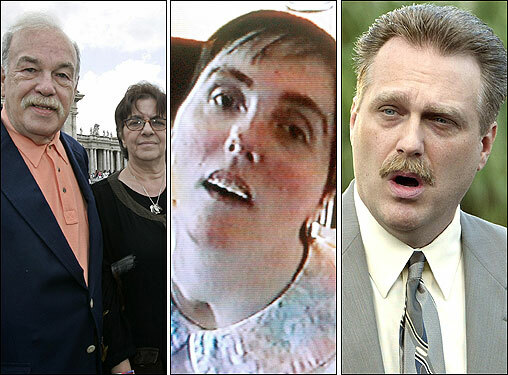 The recent elevation in national news of the Terri Schiavo case has become an issue pulpit for both sides of the right-to-die debate. Many shades of this case show how off-track we are morally and intellectually in this country. The fight over Terri’s life has brought up a pointed irony that exposes the weakness and fickleness of the religions right, and those in government seeking to insert themselves into the situation. I see people on TV protesting, lying face down in the Florida grass, writhing and waving their hands with their mouths taped shut and sobbing into their bibles, and I just don't get the histrionics. They are praying that the outcome suits (validates?) their religious preferences rather than praying that the result is guided and informed by the practice of marriage – an institution that they, the religious right, have attempted to gild in precious metal for decades now. But the luster on that precious marriage metal has now tarnished. Why? After a long and intense crusade to define marriage as between a man and a woman, and (one would suppose) upholding the rights created within it, isn’t it ironic that the rights and institution of "traditional" marriage, even one in which a husband took a vow to appropriately represent the wishes of his wife, are being torn down in the face of a religious-based uproar? It’s the same type of paranoia that compelled people in this country to over-define marriage (again, with the religious right in partnership with the GOP and the President) as an institution of a man and woman. In other words, religious factions want the right to build up marriage in their own specific vision and also break it down when some development, opinion or action doesn't suit their preferences. This is dangerous hypocrisy, and those who have the luxury of taking a marriage vow should know that the religious right and/or our legislators could seek to invalidate your partner rights if you don’t act the way they expect you to. I also see Congress coming to a complete and screeching halt to "save" this poor woman from an inevitability that she's going to be facing no matter what happens (if you believe her doctors, which I do). This is not the purpose of our legislative branches; it is an abuse of our governmental process to allow Tom DeLay & Co. the time to make a religious statement. Do I even NEED to write a letter or make a call and tell someone on Capitol Hill that this is NOT the way we want our representatives to spend their time? I can't believe I'd even need to do that. We’ve got committees doing important work on other domestic issues and we are letting this private family problem engulf lawmakers’ energy? I've resented other acts of this President and Congress for taking up expensive and useless "missions" (remember how much Bush spent to define marriage? Or perhaps the amount spent on bringing democracy to Iraq? ), but this is just utterly unacceptable. Don’t fool yourself for a second: Republicans in Congress do NOT care about Terri Schiavo – investigations and pressure for Tom DeLay’s resignation aside, he and his colleagues just want to whip their conservative base and try to solidify votes and campaign donations. It’s offensive to me and arrogant to think they have some sort of entree into a right-to-die situation that is absolutely, categorically, none of their business, using a woman at the heart of the matter to shore up political positions. And that is clearly what is happening here. They can use whatever phony spin-doctor language they want ("judicial tyranny" makes sense coming from "activist judges," doesn’t it?). I am disgusted that we’ve lost sight of what this case represents – the right of a husband to determine the wishes of his wife; the unchallenged, incendiary rhetoric by the GOP; and the moral obsession this country has with elected euthanasia and personal rights. But more than anything, language is at the heart of how this case is being absorbed by the public and broadcast by the media. When are Democrats, Libertarians, Independents or even more moderate Republicans going to counter this nutty, insane verbiage that conservative Republicans are constantly putting out there? White House Spokesman Scott McClellan recently told CNN that “this [case] is about defending life.” They would have you believe that they are fighting a noble, erstwhile fight against evil, but all they are doing is wasting time and pandering to people who are going to vote for them anyway. I am sick and tired of reading incorrect, inflammatory and offensive GOP talking points that make absolutely no rational sense. When are we going to hear alternatives to this, and when as Americans will we hold our representatives to a higher, MUCH higher, communications standard? The moment we accept the party line, fed to us so often as it is from a shiny religious spoon with a acidic aftertaste, we will never be able to uncloud the air and give someone like Terri Schiavo the chance to manage the life she was given in her own vision. Now that Terri’s condition prevents her from doing that, Terri's husband is her best champion. He is attempting to give her a life result that he promised to uphold, as part of his marriage commitment to her. If anyone would know her wishes, he would, and those who seek to prevent him from asserting this responsibility, this freedom, are cursing and denigrating the marriage institution that many of the same people have sought to idealize. You can’t have it both ways. I’d take stock of that contradiction before taping my mouth shut with a piece of duct tape that reads, “LIFE.” Remember: Terri Schiavo agreed to share and partner her life with her husband’s, and he is attempting to interpret and administer her wishes to bring her peace and justice.